Happy Saturday everyone, I hope you are having a fantastic weekend! I had a busy day of shooting today and it was certainly a little chilly but I am so excited for everyone to see what we were up to. But before that I have another fabulous look to share with you courtesy of JD Williams USA. This time we are going to go with something that is fancy and full of detail, perfect for that extra special occasion. JD Williams USA has an absolutely fantastic selection of dresses that are perfect for all your special events be it weddings, anniversaries, galas, black tie, cruises, graduation, birthdays or the red carpet. One of the brands that they carry is Joanna Hope and after looking through the hundreds of options on their website, her gowns quickly became my favourites. Her styles all have a classic feel to them but at the same time there is so much variety that you are sure to find something that suits your taste. What I particularly appreciate is that all of her dresses are available up to a size 28. In fact, this dress comes in a size 6 to 28! I am wearing the Bead Trim Maxi Dress. And don’t be deceived everyone, this dress is not red but actually a lovely deep shade of orange, almost a rust which is very on trend. I chose this dress because the colour was unique and I couldn’t take my eyes off the bead work on the bodice. I loved the varying colours of the beads and the intricate pattern that they created. Beading like this is definitely a work of art. The price point on this dress is $157.50 US which I think is reasonable for this type of gown and the craftsmanship and quality. I also liked the fact that it had short sleeves. I normally wear sleeveless dresses but every now and then it would be nice to wear sleeves but I find long sleeves too hot and it is very hard to find dresses with short sleeves. For those of you who don’t like to bare your arms this is a great alternative to wearing a shrug or cover up. This dress has a classic A line silhouette and is fully lined with a georgette overlay on the skirt. There is also a little bit of pleating at the waist. I am wearing the size 28 and I was happy with the fit. There isn’t any stretch to this dress so the fit was a plus for a new brand. My only complaint? I wish that the dress was a little bit longer, it doesn’t quite fall to my ankles and I wasn’t wearing much of a heel. So for those of you who are petite, this would probably be a plus! This dress is very glamourous on its own so I decided to add one statement accessory, sweep my hair up so you can see the beautiful bead work and then kept the rest to gold metallics. These shoes are a pair of oldie but goodies as I like to call them out of my closet because we had a little bit of a customs delay with the shoes I chose from JD Williams USA (Canadian customs really needs to learn to help a girl out lol). I gave you the link to those shoes because man do I love them and I think they would be perfect for this dress. I then added this great gold clutch from JD Williams USA. It was the perfect colour with a bit of texture and I like the size, unlike a lot of clutches it has room for all the essentials including my IPhone 7 Plus. It is such a treat to be able to buy a dress, accessories and shoes all at once. For those of you who don’t like shopping, it makes putting an outfit together a breeze. I then added these major statement earrings from H&M. I loved adding the pop of black to play off some of the bead work along with the pearls and gold beads. These earrings are surprisingly light weight for their size. Finally a geometric bangle from my collection was the perfect finishing touch. 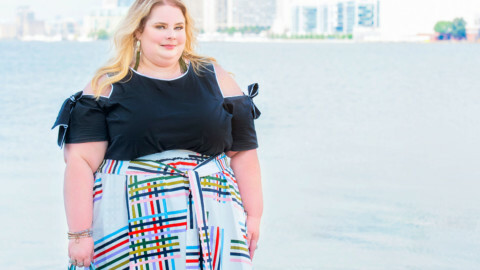 As I continue on my blogging journey, I continue to be amazed at the increasing number of options that are out there for plus size women and I am happy to introduce you to a new brand like JD Williams USA. The holidays are just around the corner and if you are in the market for something special, be sure to check them out. This post was sponsored by JD Williams USA but all opinions are my own. Thank you to Stef of Stefanie Augusteijn Photography for these beautiful photos.